It is uncharacteristic of me to review HBO original films and documentaries even though they are often of such high quality that they surpass many of the movies given wide release in the theaters. 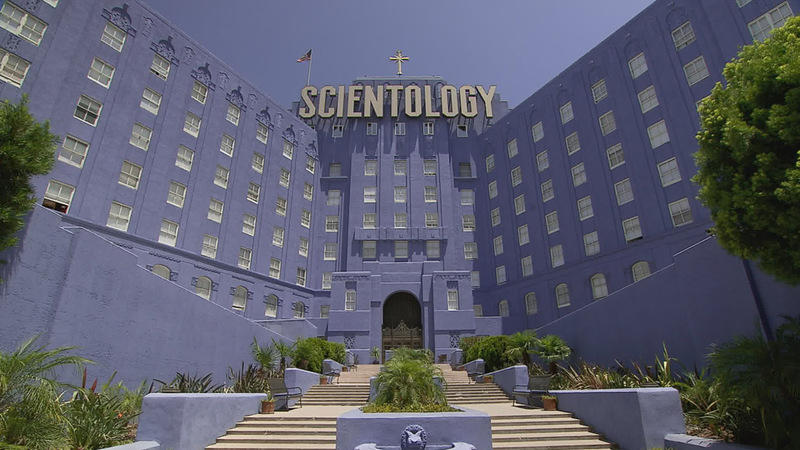 However, I found that Going Clear: Scientology and the Prison of Belief to be not only a very poignant and important documentary about a religion often shrouded in mystery, but it was also one of the most entertaining films I have seen in 2015 thus far. It opens up with voices off screen revealing their inner most thoughts and fears as we see metallic cylinders, wires and hands holding those objects. These we will learn are paramount to the belief in Scientology and how its members move upward in the ranks towards achieving total clarity. The documentary begins describe the early days of Scientology giving background about its founder, L. Ron Hubbard. Director Alex Gibney paints Mr. Hubbard in a very unflattering light. The film details his cowardly military actions during World War II, his association with unsavory characters like Aleister Crowley, and how he originally wanted to make Scientology an official religion simply to receive tax exempt status from the government. It does a good job explaining the inner workings of Scientology interviewing former members of the “Church of Scientology” that are in the entertainment industry. They explain how it starts off trying to improve people’s personal image of themselves and obtain happiness in life, but then to move up each step in scientology they must pay thousands of dollars in order to achieve a higher level of “clarity”. Eventually it gets to the point where you reach the top tier and can read L. Ron Hubbard’s handwritten story of Lord Xenu and how he put souls into volcanoes on Earth trillions of years ago. Pretty much if you saw the South Park “Trapped in the Closet” episode you already know the story. Filmmaker Paul Haggis (Crash) is one of the former members of the church featured in the documentary and his reaction to learning about Lord Xenu is one of the films funniest and most indelible moments. Which brings us to the celebrities in Scientology. In order to continue to be in the church you have to pay a lot of money to keep going to meetings and moving up. The two highest profile scientologists are obviously John Travolta and Tom Cruise. Gibney explains how each of these actors joined the church and illustrates Travolta as a sympathetic figure who wants to leave but because of the skeletons in his closet that the Church of Scientology knows about, he is trapped, a prisoner of his beliefs. Cruise on the other hand is depicted as having a sort of man-love relationship with David Miscavige, the ambitious leader of Scientology who replaced Hubbard after his death in 1986. It shows Miscavige coddle Tom Cruise’s ego and blames him for manipulating Tom Cruise to end his marriage with Nicole Kidman because her father was a psychologist, an “undesirable” and “dangerous person” who could threaten the Church. It was an elaborate scheme its most famous member a vocal advocate of the cult-like religion. The most dangerous and shocking aspect of Scientology that the film shed light on was the physical pain and torture Miscavige would put on some of the church’s highest members. It is like hazing a fraternity only it goes on for much longer and is bizarre when you realize Scientology wants to be viewed as a religion (and is by our government). You have to ask yourself, what religion would do this to its followers just to ensure loyalty? It’s like the Salem witch-hunts or the Spanish Inquisition. Going Clear: Scientology and the Prison of Belief is categorized as a documentary but I use that word cautiously to describe this film. To me a documentary is a non-fiction film that uses the cinema verite style, one that should present images and facts and allows a story to develop as the camera’s roll. This is the Maysles Bros. style as can be seen in their great documentaries Salesman (1968) and Gimme Shelter (1970). Director Alex Gibney uses the Michael Moore school of documentary filmmaking where he is making more of a propaganda piece. He started out with the intention to condemn scientology and there is no denying that he does a convincing job revealing many items that I am sure David Miscavige and Tom Cruise would have wished to remain secret. It is not a true documentary but like some of Michael Moore’s best movies, it is undeniably entertaining and enlightening. The South Park episode mentioned above was unavailable to stream, you can watch it on Hulu. Below is the trailer for Paul Thomas Anderson’s The Master (2012) a film that slyly depicts L. Ron Hubbard and how he founded Scientology in the guise of a fictitious story. This documentary is great. It so interesting I watched it twice (rare for me).